The Massie Hills trails are in very good shape for this time of year. There are a few places you may have to take your skis off to step over running water but overall quite skiable. The attached pictures were taken this afternoon. It has been a great season, hats off to the trail groomers. 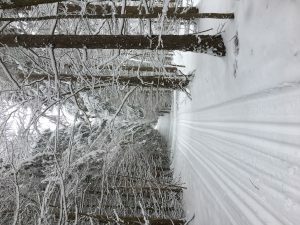 The Massie Hills trails have been groomed and track-set once again! About 3 inches of snow fell overnight on the existing trail base. There are a few bare areas but the trails are in reasonable condition for this time of year. Enjoy some late-season skiing. The report from the field is that we still have skiable trails. 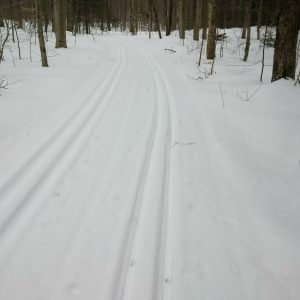 As is usual for Spring skiing, the trails will be alternately icy or slow depending on whether that section is in the sun or shade. Skiers are advised to ski with caution and within their ability. 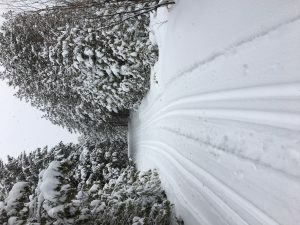 The trails have not been groomed since the last snowfall and it is unlikely they will be groomed and track-set again this season unless we receive another significant snowfall. I would like to take this opportunity to once again thank our dedicated groomers and our membership coordinator for all the work they do to make this happen for all of us. The groomers were out this afternoon and report that other than a couple of low spots that are flooded (and now roped off with flagging tape) the trails are in good shape. There is about a foot of base left with some fresh snow today. They didn’t finish grooming today so will be back out tomorrow morning. Enjoy this late-season opportunity to ski. 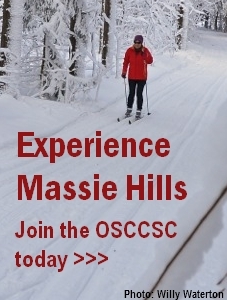 There is still some good skiing to be had out on the Massie Hills trails. We have some fresh snow in the existing tracks and the weather isn’t supposed to get really warm until Wednesday (6 degrees) and Thursday (10 degrees). The attached picture was take this morning. Maybe see you on the trails tomorrow.